Thanks to our 2017 sponsors and partners! Sonya Jones, Associate Curator/Curator of the Thomas Bouckley Collection, has been at The Robert McLaughlin Gallery since 2008. Prior to joining the RMG, Jones worked for a private art dealer in Toronto, the Canadian Heritage Information Network, and Carleton University Art Gallery. She holds an Honours BA from Carleton University, and a post-graduate certificate in Museum Management and Curatorship from Fleming College. She has curated over 30 exhibitions featuring the Thomas Bouckley Collection of historical photographs, including From the Ground Up: Aviation History of Oshawa, Under the Big Top, and Mindful Manipulation. She has also curated 6 contemporary art exhibitions by Durham Region artists, including Revealing Spaces: Kate Wilhelm, Shaun Downey and Andrea Carvalho, Viewfinders: Lesa Moriarity, Mike Berube, and Christine Lucy Latimer, the travelling exhibitions The lingering: Toni Hamel and Jay Dart: Greetings From Yawnder!, and the upcoming exhibition Durham Reach (co-curated with Linda Jansma). Jones is a member of the Durham Region Area Archives Group, the Oshawa Historical Society, and was the secretary of the Oshawa WWI Commemorative Project Committee. She has juried for Station Gallery, Latcham Gallery, and Ajax Creative Arts. 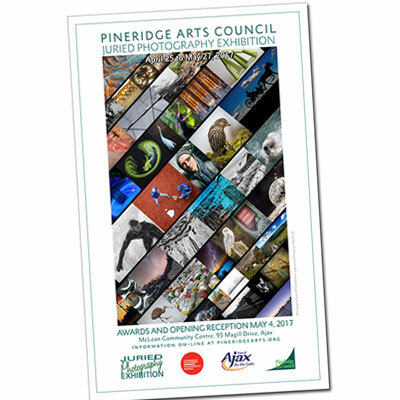 I was honoured to jury this year's PineRidge Arts Council photography exhibition. My goal was to include as many photographers as possible and have a diverse representation of subjects and style. Jurying can be a challenging task, but one that is always a rewarding experience. 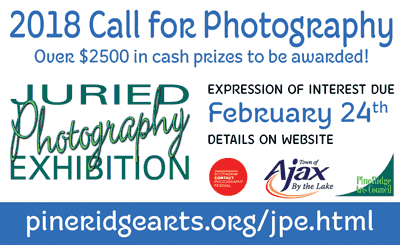 This gave me an opportunity to see the vast and impressive photographic talent in the community. Many thanks to PRAC and all the participants, as well as congratulations to the selected photographers and award winners.